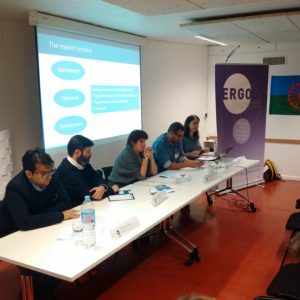 At a panel debate organised by ERGO Network on Monday (27/11/2017) preceding the 11th Meeting of the European Platform for Roma Inclusion, European policy makers and civil society representatives discussed what is needed to better support young Roma on the labour market. Youth unemployment in the EU has decreased in 2016 – good news after years of economic recession. However, for young Roma the situation is not at all the same. The rate of young Roma not in education, employment or training (NEET) has risen in almost all Member States with a high Roma population: 63 % of Roma aged 16-24 are not in employment, education or training, compared with the 12 % EU average on the NEET rate for the same age group. During the debate, Simona Torotcoi, researcher in the Central European University, presented a research study prepared with members in ERGO Network. The young people interviewed expressed as greatest obstacles the lack of quality education and training, which is in many cases influenced by school segregation of Roma and a high drop-out rate. But also the generally bad labour market situation in their area with salaries below a living wage and antigypsyism by employers play a big role for their situation. Torotcoi pointed out: “The most surprising finding was that young Roma have internalised antigypsyism so much that they told us Roma are lazy, even though only a small number of them have ever refused a job”. remarked that the lack of access to quality education was the main factor for Roma youth unemployment. “Many employers are willing to employ Roma if they have the right skillset; therefore the biggest change needs to happen in the education systems”. There is a lot of pessimism when it comes to Roma employment, but ERGO’s study showed that young Roma are motivated to work and that positive examples of employment measures exist. Melinda Kassai from ERGO Member Pro Cseherat presented the example of a community gardening project in Hungary that supports the income of rural Roma communities in a sustainable way. She explained that with some more investment, projects like this could be up-scaled and transferred to many similar communities in order to yield positive results both for Roma and non-Roma. Thorsten Afflerbach, Head of Division for the Roma and Travelers Team in the Council of Europe, expressed the need for a better exchange between national governments on employment measures that have proven to be successful and in this regard welcomed ERGO’s research that presents 10 promising practices identified by grassroots organisations. 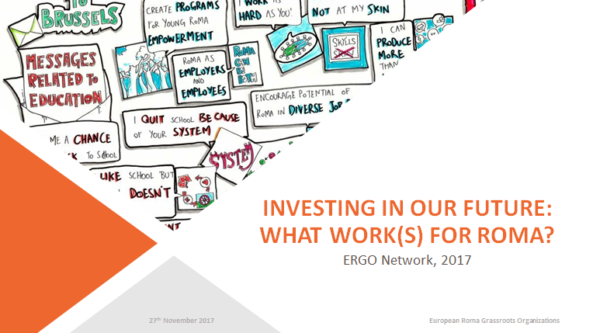 For ERGO Network it is essential that young Roma themselves are involved in the design of effective policies and measures that can improve their situation on the labour market, as beneficiaries know best what support they need. 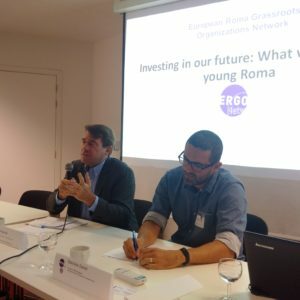 In the framework of the research project, young Roma ask their national governments to invest more in youth entrepreneurship, improve the cooperation between public employment services, NGOs and educational institutions, ensure a decent level of wages and combat antigypsyism on the labour market. Such measures would not be possible without the EU’s support and assistance to the Member States through its key actions and financing. ERGO Network passes on these messages to the 11th EU Roma Platform and urges the European Union to put greater emphasis on young Roma in its employment, education and Roma policies and programmes. This includes a revision of the European Youth Guarantee and the Youth Employment Initiative to give particular attention to hard-to-reach groups, inclusion of specific targets for Roma employment in the Social Scoreboard of the European Pillar of Social Rights and concrete strategies to combat antigypsyism on the labour market. Please find more information on the research ‘Investing in our Future’: What work(s) for young Roma here.